The Government has decided that Cranbrook, the new town planned near a flood plain in East Devon, re-badged as an ‘eco town’, will be a prototype for five more across the country. Is this a genuine initiative or cynical ‘greenwash’? What would a real eco development look like? To answer that question I have spent the past two summers cycling across Europe, studying cities where claims are matched by real achievements. How developments like Cranbrook merit the ‘eco’ label is difficult to understand. From now on, we are told, they will have ‘zero carbon’ housing, but the Government has already proposed that all new housing be zero carbon from 2016. They will be ‘mixed use’ (housing and commercial) with a ‘high proportion of affordable housing’ – both normal practice for large developments nowadays. In her press release, Housing Minister Yvette Cooper talks of “brownfield sites” but the prospectus for local councils says only that ‘eco towns’ must be “new settlements, separate and distinct from existing towns”. Like Cranbrook, it hints, they should use greenfield land. The greatest gap between spin and reality relates to transport: eco towns will “achieve a higher proportion of journeys by foot, cycle and public transport”. The word ‘proportion’ is carefully chosen. Research suggests small towns near larger cities generate more car mileage than suburbs of those cities. This is true not only in Britain (Oxfordshire in one study) but even in regions such as greater Stockholm where public transport links are better. These links help reduce the proportion of car journeys, but the total car mileage (and associated CO2 emissions) is still higher than in the suburbs, because distances are greater. The transport plans for small settlements like Cranbrook, or Northstowe near Cambridge, tend to concentrate on single routes in and out of a city centre. But travel patterns are rarely as neat as planners imagine. People move in all directions, and if the car is the easiest alternative, most will drive. There is evidence that local employment opportunities can actually make the situation worse – encouraging inward as well as outward commuting. Claims that new developments will reduce car journeys are not new. They were made before work began on Poundbury, Prince Charles’ model development, near Dorchester. When researchers from Oxford Brookes University went there in 2004 they found even more commuting by car (64% of journeys) than across rural West Dorset as a whole (58%). In other cases, neither councils nor developers have bothered to measure whether reality has lived up to the claims in their glossy brochures. The 2001 census reveals a depressing pattern: outside the inner cities cars dominate almost everywhere. Not so elsewhere in Europe. Freiburg is Germany’s ‘solar city’. Environmental industries are important employers there. Cars have been progressively removed from the city centre and they now account for only one journey in three. Vauban, a new eco development on the outskirts, uses solar electricity, a combined heat and power plant and passive solar design, to heat and power its 2,000 houses. 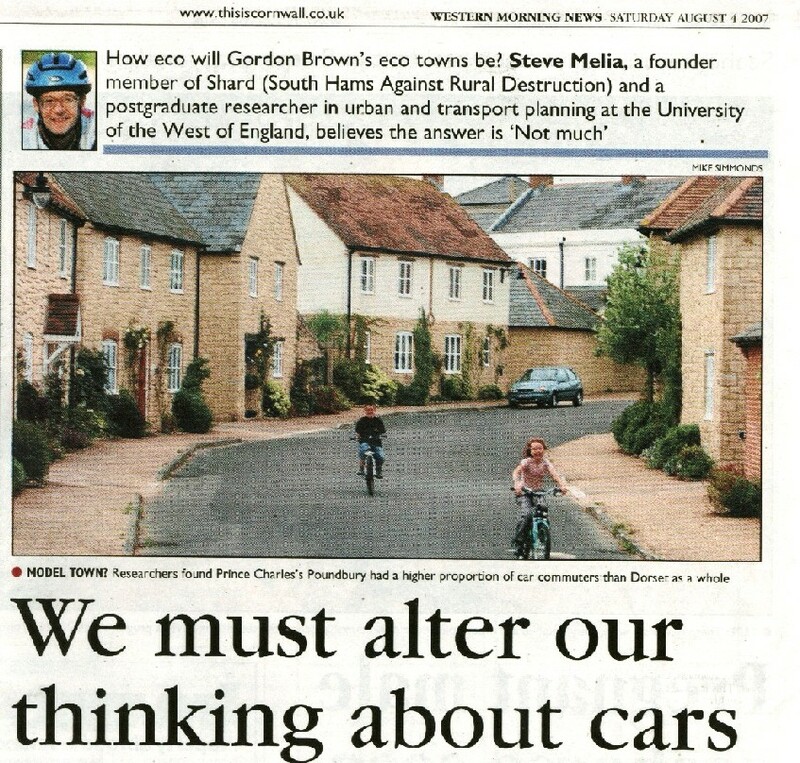 The British ‘eco town’ prospectus mentions Vauban, but glosses over the key element which has made it such a desirable area to live: its carfree streets. Vehicles may enter at walking pace to pick up and deliver but parking is restricted to multi-storey car parks on the fringes. With no threat from cars, the streets are filled with children: playing, skating – unicycling has become the latest craze. Even residents who own cars (about half) use them very little: three quarters of the working population cycles to work. Most others take the tram. This illustrates some issues the promoters of ‘eco towns’ ignore at their peril. European cities with the highest public transport use nearly all have trams or light rail. Buses and conventional rail are only ever part of the solution. In any case walking and cycling account for more journeys than public transport. It is possible to plan for these where cities are compact. Vauban would not work if it were separated from its city and spread out in suburban style like Cranbrook. In Groningen, a Dutch city of 180,000 people, cycling has been gradually increasing, to 60% of all journeys in 2006. Transport official Cor Van der Klaauw explains the City’s policy: a “coarse” network for cars and a “fine” network for cycling. Through traffic is restricted to a few main roads and is banned from the centre. Residential areas are giant cul-de-sacs for cars, while a network of continuous cycle routes covers the city in every direction. Bridges, tunnels and dozens of short-cuts, give an advantage to the bike. People of all ages cycle because it is quicker and more convenient than driving. In Britain the trend is moving in the opposite direction. It has become an article of faith for many developers and planners that vehicles must be allowed to circulate in all directions (“permeability” is the buzz word). In some places, this is even leading them to rip out pedestrianised shopping areas. Poundbury, which helped set this trend, is flat like Groningen. Southern England has a better climate than the Netherlands, but just 1.9% of Poundbury’s residents cycle to work. Over three quarters drive elsewhere to shop. It can be argued that foreign examples wouldn’t work here, in a different culture. Of course, policies must adapt to circumstances, but most measures taken in cities like Freiburg and Groningen can be found in some form in Britain. Even carfree developments are now beginning on a small scale in places like Camden and Brighton. The missing elements are political will and coherence: joined up cycle routes and joined up thinking. Cultural preferences towards driving, cycling or walking are not genetically inbred; they can be changed. Across Europe, car use was rising and cycling was falling until the oil crisis of 1973 triggered a change in a few countries. Climate change should provoke a similar reassessment here and now. De-regulated buses, rail pricing, and competition laws which give everyone a right to opt out of district heating schemes are just a few of the national policies which make the task more difficult. If the Government is serious about eco development, it will look critically at these, and encourage real eco developments with carfree areas in compact cities, instead of commuter towns in open countryside.